I found a useful piece of software to control internet cravings. I found the audio file that was causing Logic Pro 8 to have a fit every time I tried to work on Catch The Sun so I can finally move past that! Yeah! 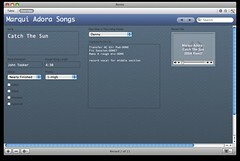 I'm spending some time cleaning up my new Marqui Adora song database I created with Bento.